Leadership and communication expert Michelle Loch, shares some captivating statistics about workplace conversations. In the article below, Michelle highlights how conversations at work, can improve culture, performance and employee engagement. For More information about Michelle Loch, contact the Great Expectation Team 1300 55 64 69. Leaders spend 80% of their time in conversation. On average, an employee spends around 37% of their time in meetings – which are essentially group conversations. That’s a rather large percentage of the time spent in the workplace on conversations, and that doesn’t include emails and chats. Let’s face it, emails create work…skillful conversations get things done! What I think organisations have still not been able to capitalise on is the enormous opportunity that this presents in terms of improving culture, performance and employee engagement. EVERY conversation is an OPPORTUNITY…. And most of all, to create and support quality thinking through quality conversation. Conversation is an art, and a skill. Developing powerful conversation skills in your leaders provides a surprising ROI in terms of the positive influence that they can have on the habits, thinking and behaviour of those around them, and over their own growth and development as well. The conversations in your organisation are a clear predictor of the health of your culture – and all it takes is a little attentive observation to find the underlying patterns. Here are five things to observe and assess. 1. Listen to where the conversations are FOCUSED. Are they focused on the past or on the future? Are they focused on barriers, or possibilities? 2. Watch the way people are LISTENING to each other. Are they waiting to interject with their own idea or solution, or are they being CURIOUS and taking the time to dig deeper and understand another person’s point of view or perspective? Are they finishing sentences? Are they doing other things while listening (think meetings and phones) or are they present and respectful to what others have to say with no agenda? 3. See if there is more TELLING than ASKING in the conversations. Research tells us that in organisations 95% of the communication is ‘tell’ – yet people don’t like being told what to do! People feel engaged and respected when they feel like they matter, and that what they do matters. Do the leaders in your organisations care enough to ask? 4. Look for the EMOTION in the conversations around your organisation. What emotions are prominent? What tone is evident? And are emotions ignored, or explored? 5. And finally, are the conversations that you hear around your organisation USEFUL, or just interesting? Do they connect and relate to bigger goals? Are they distractions or procrastinations? 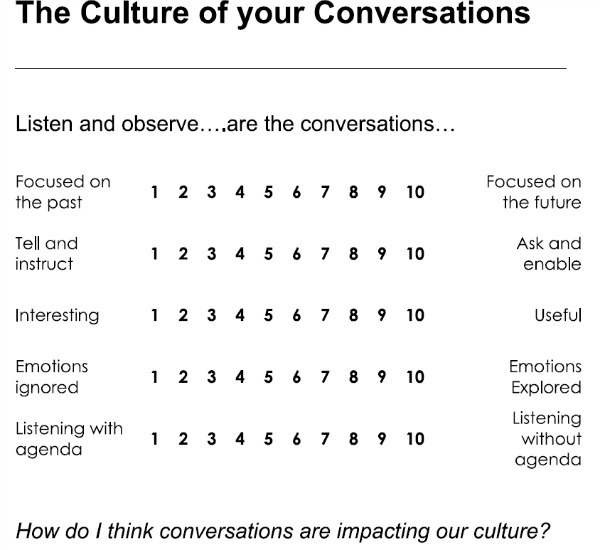 If it helps, we've included a quick diagnostic below titled 'The Culture of your Conversations'. It is a wonderful tool to kick start your listening and observations around your organisations cultural health! Michelle Loch is a communications and leadership expert in the neuroscience of human motivation, powerful conversation and self-leadership. Michelle inspires audiences to change their thinking, increase their impact and become a leader others want to follow by rewiring the way they think. If you would like to know more about Michelle's keynote presentation contact the team at Great Expectation.